Is this what it's come to? Smart, creative adults needs to pay for software to save themselves from distraction by the internet? Apparently. Freedom is a simple productivity application that locks you away from the internet on Mac or Windows computers for up to eight hours at a time. 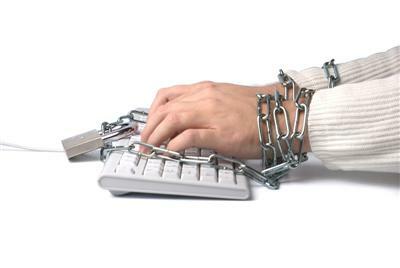 Freedom frees you from distractions, allowing you time to write, analyze, code, or create. At the end of your offline period, Freedom allows you back on the internet. You can download Freedom immediately for 10 dollars, and a free trial is available. It then goes on to list the writers who have positively praised Freedom software in various interviews, including Nora Ephron, Zadie Smith, Dave Eggers, Nick Hornby, Miranda July, and many others. I'm sure others have already commented on the almost Pascalian irony here. Let me just note the obvious: The development of such software is, technically speaking (I'm not here to judge), the confirmation of the absence of virtue--that is, the absence of adequate internal dispositions to pursue the good and resist temptations away from that. In short, again technically speaking, such software is a corrective for the vice of sloth--but a wholly external corrective. Aquinas notes that law and virtue are sort of in inverse proportional relation to each other: the more virtuous I am (having good habits), the less the external constraint of law is necessary. Conversely, the more vicious I am, the more the force of law is necessary. In this particular case, what has happened is that we have unwittingly imbibed habits of distraction: the material rhythms of an "online" life have inculcated in us patterns of behavior--and hence internal dispositions--to seek distraction. It's not that we lack habits; it's that we have acquired habits of distraction. And so software that constricts me is called "Freedom." Don't get me wrong: something about this thrills my Augustinian heart. As I've argued elsewhere, Augustine is one of the first to articulate the Christian understanding of freedom that is almost incomprehensible in our libertarian age: to be "free" is actually to be rightly constrained, to be empowered to choose the good. I am free just to the extent that I am a slave of Christ, and I am free just to the extent that the Spirit of God has so habituated me that I become "disposed" toward the good. "Sanctification" is sort of the extension of regeneration over time such that my habits are renewed. So it's ultimately not just submitting to an external law (though that's a start) but ultimately absorbing an internal reorientation. So in some ways, to call this software "Freedom" is a kind of functional, unwitting Augustinianism. But I doubt its creators--or many of its users--are interested in signing up to be consistent Augustinians (cue young enthusiasm for Ron Paul here). But their willingness to submit to constraint in order to be free might be a backhanded clue to what it takes to be human.